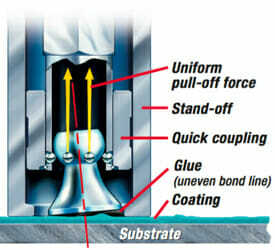 Adhesion Tester Self Alignment is a crucial feature as unequal pulling force during testing caused by uneven adhesive bond lines and coating surfaces can result in random, inexplicable readings. To obtain more repeatable and meaningful adhesion measurements, it is imperative that the pulling force applied to the test dolly is uniformly distributed over the surface being tested. The Self-Aligning Dolly enables uniform distribution of the pulling force over the surface being tested, preventing a one-sided pull-off. Unique Test Dollies: The PosiTest Adhesion Tester uses inexpensive single-use aluminum dollies designed according to internationally accepted standards and practices. They have a full 20 or 50 mm surface diameter with no holes to clean or keep from filling with adhesive. The PosiTest Adhesion Tester compensates for misalignment. The uniquely spherical articulating dolly head is engaged into a ring of small ball bearings, ensuring correct alignment. This feature is found only on the PosiTest Adhesion Tester.